SACRAMENTO, Calif. (AP) Two consecutive fourth-quarter meltdowns put the Wizards in a hole on their current road trip. It also set the stage for Washington’s most lopsided win of the season. A defense that forced 20 turnovers and an offense that set a season high with 17 3-pointers helped, too. 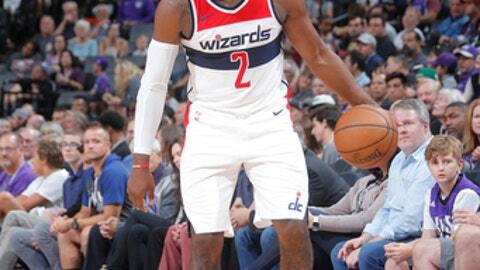 John Wall scored 11 of his 19 points in the first quarter and had nine assists, Otto Porter Jr. had 16 points and the Wizards beat the Sacramento Kings 110-83 on Sunday. The 27-point victory kept the Wizards out of the record books. Washington’s first five games were decided by five points or fewer; no team had ever opened the season with six. Wall made it a moot point early by making his first four shots, including three 3-pointers, as Washington jumped to a 13-0 lead that was never threatened. The Wizards were up 63-32 at halftime, had a 36-point advantage early in the third quarter and prevented the Kings from getting closer than 27 the rest of the way. Mike Scott added 13 points and Kelly Oubre Jr. had nine points and seven rebounds to help Washington snap a two-game losing streak. Beal was surprised to be playing at all. The veteran guard expected to be suspended after the fight with Green late in the first half of Friday’s 120-117 loss to the Warriors. Beal and Green received technical fouls and were ejected from the game. While Beal played, Washington was without forward Markieff Morris and guard Carrick Felix. Both received one-game suspensions for coming off the bench during the fight. ”Once they got on us, our young guys got a little frantic and then the wheels kind of came off,” Kings coach Dave Joerger said. Brian Bogdanovic scored 15 while Kosta Koufos added seven points and 10 rebounds for Sacramento. Wizards: Washington’s 35 points in the opening 12 minutes were their most in any quarter this season. … The day off probably benefited Morris, who is still on the mend from sports hernia surgery. The Wizards’ bench combined for 45 points. Kings: Sacramento missed its first nine shots and 13 of 16 to begin the game. … Zach Randolph and George Hill were given the day off by Joerger. Wizards: Host Phoenix on Wednesday night. Kings: Travel to play the Pacers on Tuesday night. Sacramento hasn’t won in Indiana since Dec. 23, 2015.